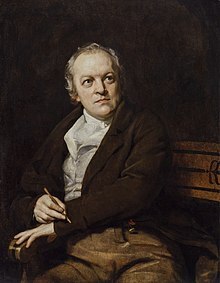 William Blake (November 28 1757 – August 12 1827) was an English poet, Christian mystic, painter, printmaker, and engraver. 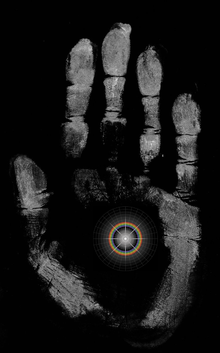 The archetype of the Creator is a familiar image in his work. Here, Blake depicts his demiurgic figure Urizen stooped in prayer, contemplating the world he has forged. 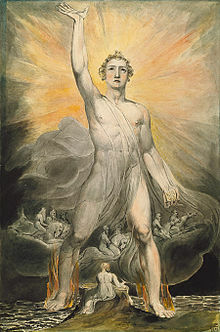 The Song of Los is the third in a series of illuminated books painted by Blake and his wife, collectively known as the Continental Prophecies. 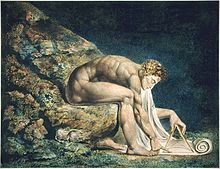 Blake's "Newton" is a demonstration of his opposition to the "single-vision" of scientific materialism: The great philosopher-scientist is isolated in the depths of the ocean, his eyes (only one of which is visible) fixed on the compasses with which he draws on a scroll. He seems almost at one with the rocks upon which he sits (1795). Such end true lovers have. That bards of old enjoyed in you! The sound is forced, the notes are few! True superstition is ignorant honesty & this is beloved of god and man. They suppose that Woman's Love is Sin; in consequence all the Loves & Graces with them are Sin. But I am black as if bereaved of light. And be like him and he will then love me. Could scarcely cry 'weep! 'weep! 'weep!'weep! As Iguard o'er the fold." And now let me finish with assuring you that, Tho I have been very unhappy, I am so no longer. I am again. Emerged into the light of day; I still & shall to Eternity Embrace Christianity and Adore him who is the Express image of God; but I have travel'd thro' Perils & Darkness not unlike a Champion. I have Conquer'd, and shall still Go on Conquering. Nothing can withstand the fury of my Course among the Stars of God & in the Abysses of the Accuser. My Enthusiasm is still what it was, only Enlarged and conform'd. I have labour'd hard indeed, & have been borne on angel's wings. Till we meet I beg of God our Saviour to be with you & me, & yours & mine. Pray give my & my wife's love to Mrs Butts & Family, & believe me to remain. The Foundation of Empire is Art & Science Remove them or Degrade them & the Empire is No More — Empire follows Art & Not Vice Versa as Englishmen suppose. The reason Milton wrote in fetters when he wrote of Angels and God, and at liberty when of Devils and Hell, is because he was a true poet and of the Devils' party without knowing it. Those who restrain desire do so because theirs is weak enough to be restrained; and the restrainer or reason usurps its place & governs the unwilling. Prisons are built with stones of law; brothels with bricks of religion. The ancient poets animated all objects with Gods or Geniuses, calling them by the names and adorning them with the properties of woods, rivers, mountains, lakes, cities, nations, and whatever their enlarged & numerous senses could perceive. And particularly they studied the genius of each city & country, placing it under its mental deity; Till a system was formed, which some took advantage of, & enslav'd the vulgar by attempting to realize or abstract the mental deities from their objects: thus began priesthood; Choosing forms of worship from poetic tales. And at length they pronounc'd that the Gods had order'd such things. Thus men forgot that all deities reside in the human breast. He turned up his eyes. Holy and meek, she cries. Dreaming o'er the joys of night. Plants fruits of life and beauty there. Every bit as well as war and slaughtering." Shall win the lover's hire. You'll quite remove the ancient curse. And builds a heaven in hell’s despair. That walked among the ancient trees. Is given thee till the break of day. And builds a hell in heaven’s despite. The Sick Rose, plate 39. But Want of Money & the Distress of A Thief can never be alleged as the Cause of his Thieving, for many honest people endure greater hard ships with Fortitude. We must therefore seek the Cause else where than in want of Money for that is the Misers passion, not the Thiefs. Fun I love, but too much Fun is of all things the most loathsom. Mirth is better than Fun & Happiness is better than Mirth. To the Eyes of a Miser a Guinea is more beautiful than the Sun & and a bag worn with the use of Money has more beautiful proportions than a Vine filled with Grapes. The tree which moves some to tears of joy is in the Eyes of others only a Green thing that stands in the way. Some see Nature all Ridicule and Deformity, and by these I shall not regulate my proportions; and some scarce see Nature at all. But to the Eyes of the Man of Imagination, Nature is Imagination itself. As a man is, So he Sees. As the Eye is formed, such are its Powers..
Acts themselves alone are history, and these are neither the exclusive property of Hume, Gibbon nor Voltaire, Echard, Rapin, Plutarch, nor Herodotus. Tell me the Acts, O historian, and leave me to reason upon them as I please; away with your reasoning and your rubbish. All that is not action is not worth reading. Art is the tree of life. Line 56. Compare Psalm 30:5 (KJV): "weeping may endure for a night, but joy cometh in the morning." But Pity stands before the door. Mock on, mock on, Voltaire, Rousseau. Mock on, mock on — 'tis all in vain! And a little lovely moony night. Is an arrow from the Almighty's bow. Rouze up, O Young Men of the New Age! set your foreheads against the ignorant Hirelings! For we have Hirelings in the Camp, the Court & the University, who would, if they could, for ever depress Mental & prolong Corporeal War. Bring me my Spear — O clouds, unfold! Go into it yourself and see how you would do. I oft have wished for Hell for ease from Heaven. Poetry Fetter'd. Fetters the Human Race. Nations are Destroy'd, or Flourish, in proportion as Their Poetry, Painting, and Music are Destroy'd or Flourish! I rest not from my great task! I will not Reason and Compare: my business is to Create. Frontiespiece, plate 1, line 8 (as it seen on the additional plate, Fitzwilliam Museum). Every Thing has its Vermin O Spectre of the Sleeping Dead! Frontiespiece, plate 1, line 11 (as it seen on the additional plate, Fitzwilliam Museum). Lo! we are One; forgiving all Evil; Not seeking recompense! One hair nor particle of dust, not one can pass away. And there Jerusalems pillars stood. For art and science cannot exist but in minutely organized Particulars. Is a Theatre? are they Two & not One? can they Exist Separate? O Demonstrations of Reason Dividing Families in Cruelty & Pride! Thinking as I do that the Creator of this World is a very Cruel Being & being a Worshipper of Christ, I cannot help saying: "the Son, O how unlike the Father!" First God Almighty comes with a Thump on the Head. Then Jesus Christ comes with a balm to heal it. This world of imagination is the world of eternity. I assert, for myself, that I do not behold the outward creation, and that to me it is hindrance and not action. "What !" it will be questioned, "when the sun rises, do you not see a round disc of fire somewhat like a guinea !" Oh ! no, no ! I see an innumerable company of the heavenly host crying "Holy, holy, holy is the Lord God Almighty !" I question not my corporeal eye any more than I would question a window concerning a sight. I look through it, and not with it. …some say that Happiness is not Good for Mortals & they ought to be answerd that Sorrow is not fit for Immortals & is utterly useless to any one a blight never does good to a tree & if a blight kill not a tree but it still bear fruit let none say that the fruit was in consequence of the blight. Inscription on Illustrations to Dante "No. 16: HELL Canto 7"
That is the trick of the Ancient Elf. Then descended the cruel rod. ‘If Thou Humblest Thyself, Thou humblest Me. Thou also dwell’st in Eternity. I made my voice heard all over the nation. Either for Englishman or Jew. "My children die for lack of Bread." The Old and New Testaments are the great code of art. [T]he man who never alters his opinions is like standing water, and breeds reptiles of the mind. Attributed to William Blake by Michael J. Gelb in Creativity on Demand: How to Ignite and Sustain the Fire of Genius (2014), but cannot be retrieved in The Marriage of Heaven and Hell, xxii. ..I saw William Blake (in his dream), noble emanation of English genius... ...’Have confidence in your objects,’ he said, 'do not let yourself be intimidated by the horror of the world. Everything is ordered and correct and must fulfill its destiny in order to attain perfection. Seek this path'.. ..I awoke and found myself in Holland in the midst of boundless world turmoil. But my belief in the final release and absolution of all things, whether they please or torment, was newly strengthened. To me, it seems best to read Blake in company with his truest peers, Shakespeare and Milton, and with his greatest contemporaries, Wordsworth and Shelley. He was a visionary, rather than a mystic, and, like D. H. Lawrence and Sigmund Freud, he hoped to encourage us to exalt our human potential. Perhaps Blake can be best termed an apocalyptic humanist, who urges us never to forget that all deities reside in the human breast. 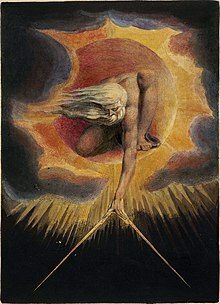 I learned this bit of wisdom from a principle of William Blake's which I discovered early and followed far too assiduously the first half of my aesthetic life, and from which I have happily released myself and this axiom was: "Put off intellect and put on imagination; the imagination is the man." From this doctrinal assertion evolved the theoretical axiom that you don't see a thing until you look away from it which was an excellent truism as long as the principles of the imaginative life were believed in and followed. I no longer believe in the imagination. Marsden Hartley in his article Art and the Personal Life,, 1928; accessed online Aug. 7, 2007 on Artchive, n.p. There is no century in which Blake would not have seen angels. Thomas Merton, in "Mystics and Zen Masters"
It is not at all certain that a merely moral criticism of society may not be just as "revolutionary" — and revolution, after all, means turning things upside down — as the politico-economic criticism which is fashionable at this moment. Blake was not a politician, but there is more understanding of the nature of capitalist society in a poem like "I wander through each charter'd street" than in three-quarters of Socialist literature. In the modern world, the Romantics were the last major cultural movement to assert the "truth of the imagination," defending art as a way of knowing the world that equalled or surpassed scientific reason. In their resistance to what Blake called "Satan's Mathematik Holiness," their goal was not to reject science but to enlarge it. ...the Romantics sought to understand by augmentation. Blake deeply admired science; he never failed to portray it heroically. But he was concerned that science saw the universe from an odd angle that hid as much as it revealed. Science screened the value of things, the beauty of things, the sacredness of things as if these qualities might not really be there. Blake called this Single Vision, and contrasted it with his ideal Fourfold vision: an understanding that included the poetic, the sensuous, and the visionary along with the rational. ...he fervently prayed for our culture to be saved from the scientist's severe abbreviation of reality: "God us keep from Single Vision and Newton's Sleep." Freud was frank to admit that Romantic artists like Blake had discovered the unconscious before he had. But... he could hardly adopt Blake's unsettling view of the scientific psyche. 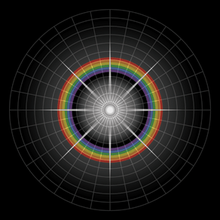 Most scientists would make very hard work of explaining how the concept of soul fits into the material universe, where there is nothing but "atoms and the void." Was this what Blake meant when he said that science was a tree of death? The death of religion? Of imagination? Both have been frequently suggested. ...Science is certainly our prime weapon against superstition and irrationalism, but in a world in which science flourishes—with or without God—love and fear remain, as do pleasure and regret, poetry and humor, art and music. The arts are not lessened by the sciences. Blake was mistaken: man's ineradicable gift, his questing curiosity, the divine discontent, is the common source of the arts and sciences.